The reception desk is open from 08:00 to 18:30 on weekdays only. Please telephone or call at the surgery during these hours. For routine appointments we would appreciate as much notice as possible. They can be booked up to about 6 weeks in advance. 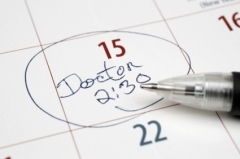 An appointment with a doctor may be taken from 08:10 to 11:00 each morning and between 14:00 and 18:00 each afternoon. We also have a limited number of appointments available in the early evening. The evenings on which these are offered varies from week to week so please telephone or call at the surgery to check availability. If you have more than one problem to discuss or you feel you are going to need more time than usual when you see the doctor or nurse - please ask for a longer appointment so that your consultation is not rushed. If you would like to be seen in a downstairs consulting room please make this clear to reception at the time the appointment is made. If you are unable to keep your appointment please let us know so that it can be offered to another patient. If you wish to be seen urgently and you do not have an appointment, you may be asked to wait until a doctor is available, but you will be seen as soon as possible. We try to keep appointments between 18:00 and 18:30 on weekdays for urgent cases only. If you would like a chaperone to be present during a physical examination, please let the doctor or nurse know. If you wish you can request a chaperone to be present during the consultation at the time you book your appointment with reception. Please let reception know if you cannot manage the stairs to the first floor consulting rooms. There is access for wheelchairs to all ground floor consulting rooms and the toilets. To book an appointment click on the link at the top of this page using your patient online account. There are some restrictions on the appointments you are able to book. You can book an appointment with the GPs but not the nurses. Appointments with the nurses vary in length, depending on the procedure required, and therefore aren’t suitable to be booked online. Online booking is available for appointments from 4 – 20 days ahead and only one appointment can be booked at a time. The online system is not available for urgent appointments. We are happy to offer telephone advice at any time during opening hours. You may be asked to hold on for the doctor or for the doctor to return your call later. Please do not ask us to visit you at home unless you are genuinely unable to get to the surgery because of the severity of your illness or symptoms. We are able to do one or two home visits an hour, whereas we are able to see 6 or 7 people an hour in the surgery. If you can get to the surgery you will be seen earlier, investigated more easily and started on treatment sooner. Home visits are rarely necessary for patients suffering from coughs, colds or flu-like symptoms. Children with fevers come to no harm being brought to the surgery. If a home visit is essential because you are housebound or too ill to come to the surgery please telephone the surgery, if possible, before 11.00. Phone the patient Travel Desk on 0845 600 6068 as soon as you have the date and time of your appointment. Please give at least 48 hours notice. It may not be possible to meet your request if they receive it with less than 48 hours notice. If you need assistance to apply for patient transport, a friend or relative can apply on your behalf. If you need assistance to apply for patient transport and you don’t have anyone to help you then please speak to a receptionist at the Surgery. Your medical condition affects your mobility so much that you would not be able to get to hospital or treatment centre by any other means. Your medical condition is such that you require the skills or support of trained staff on or for your journey. It would make your medical condition worse if you were to travel by another means. You are the parent or guardian of a child who meets any of these rules. For transport to subsequent visits, please inform the hospital appointment desk before leaving the clinic.